TIPI for short, the TI-99/4a to Raspberry PI connection is available now as a solution for connecting your 40 year old tech to modern computer networks including the Internet. TIPI was designed and programmed by Matthew Splett (Jedimatt42 on AtariAge) and some of the software was developed by Corey Anderson (Electriclab on AtariAge). The biggest problems we have with our TI-99/4a are reliable storage and getting new programs (and copies of old software we find in online libraries, ftp sites, forum postings etc) to the computer easily. With TIPI you have two easy ways to do transfer programs to your TI. Browse to HTTP://TIPI:9900 on your PC (whatever OS you have, LINUX, MAC, WINDOWS, AMIGA) as long as you have a web browser you can do this. Upload files to the TIPI drive using the web page file manager. Open a file share on any windows or samba capable PC (LINUX, MAC, WINDOWS) and copy the files directly to the TIPI drive. A cool side-effect of this feature is that I have a drive on my PC mapped to TIPI. and I can access it via the CLASSIC99 emulator as a disk drive in emulation. Essentially sharing the entire storage with the TI and emulator simultaneously. Saving a file on the emulator is instantly loadable on the TI. Regardless as to which way you use, you can upload any TIFILES format file and it will be instantly accessible. If you upload a V9T9 format file, you can easily convert it to TIFILES using the web interface. If you upload a DSK image, TIPI will automatically convert the content to TIFILES files in a folder named the name of the disk you uploaded. If there’s already a folder with that name it will add a number to the end for example a disk named TIART would become TIART1 and TIPI would automatically increment that number if there is already a TIART1 folder.. So with this folder tree I would map a drive to DSK1 that points to TIPI.GAMES.TOD for tunnels of doom games. Then in tunnels of doom I can just load the game with DSK1.PENNIES. Mapping a drive is done either in the TIPICFG utility (which is easily loaded by typing CALL TIPI in basic, or loaded from a EA5 program loader at TIPI.TIPICFG) or using the TIPIMAP program I wrote in Extended basic which allows you to arrow through the directory folders and select 1 2 or 3 to map that disk drive to the selected folder. You can also modify the TIPI configuration file in the editor of your choice on the TI by loading the file PI.CONFIG. Since most TI software expects support files to be on DSK1, Matt just added a new Auto Mapping feature to TIPI. When in auto mode, TIPI will temporarily map DSK1. to the directory that you loaded a PROGRAM image file from. This can be a basic program, or EA5, or even a data file such as Tunnels of Doom save games. The mapping is temporary… it will change if another PROGRAM image is loaded, or reset back to what is declared in PI.CONFIG (or TIPICFG) when you revisit the TI title screen. So for instance if you ran TIPI.WP.FUNNLWEB.LOAD it would automatically map DSK1. To that folder if you have AUTO turned on. Again, this configuration will be temporarily applied when a PROGRAM image file is loaded from the directory. It will last typically until you revisit the TI title screen. I personally find the ‘hard disk’ structure way more intuitive and easy to follow than the numbered disk image structure used on the NanoPEB and CF7 devices. Trying to remember which disk number of the 1000 disk image numbers is my TOD disk is near impossible, while remembering TIPI.GAMES.TOD is very simple. Downloading data from http: and https: websites directly to the TI.. Importing data from weather or stock sites on the Internet. Accessing file information from a server used in your own programs. Loading program image files directly from a web server allowing for instantly updating all users of your software as you only have to update the one file on the web server and everyone downloads it through their TIPI each time they run it. SNEK is a single user game that stores it’s high score table on the myti99.com web server allowing you to compete for high scores with all the TIPI owners around the world. RockPaperScissors is written in TI-Basic and is a real-time multi-user game of Rock Paper Scissors. This uses tipi-variables and the myti99.com web server to facilitate play. A multi-user RPG is in the works that will allow multiple users to play through their separate TI-99/4a’s and TIPI. Connecting with TELNET protocol to servers on the Internet. A version of Mass Transfer has been created that does telnet through TIPI and allows for xmodem transfers and mass transfer over telnet. It also has a phone book for listing BBS’s and their telnet addresses pre-populated with the top TI BBS numbers accessible by telnet. Using the TIPI interface to access peripherals on the Raspberry PI is simple and easy. The options are endless to expand the TIPI interface to support accessing peripherals on the Raspberry PI directly from the TI-99/4a. TIPI is open source, all of the software and source code are available on github.com for you to learn from or add to. All developers are welcome to learn from the examples provided including source code to TELNET, the TI ARTIST driver and all of the system software for TIPI there. If someone would like to write an additional driver, or add a new function or service they can do so and push to the github and it can be easily integrated into TIPI’s software and software updates are easily done over the Internet connection to all TIPI owners. DSR updates require a new eprom chip to be burned so they can not be done automatically. I offer a chip upgrade service on my store. 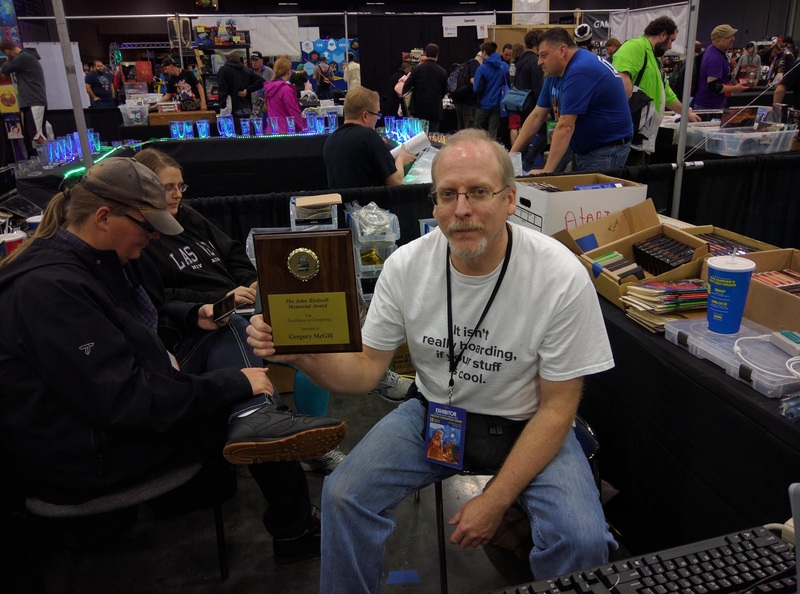 The authors of TIPI and most of this software are available on Atariage TI-99/4a TIPI support forum and the SLACK chat service to answer questions and provide support. The Raspberry PI is a open source project as well, running Debian Linux. Your TIPI drive storage is accessible (therefore back-up able) from the PI directly as well as the TI via the TIPI. Drive. I back my data up to a large hard disk I have on my network at home I use to back up my PC computers as well. Therefore even if the SD card goes bad or is corrupted on my TIPI I can easily restore the TI files to a new card. TIPI is available at http://arcadeshopper.com/store and is available in both SIDECAR and PEB CARD varieties. The SIDECAR model requires a 32k sidecar (also designed by Matt) with a 44pin connector and external power supply to operate. The Raspberry PI 3 (all models) and zeroW are both tested and recommended with the TIPI. Sidecar TIPI connected to the 32k sidecar. Raspberry PI 3b+ connected via included cable. TIPI PEB card. 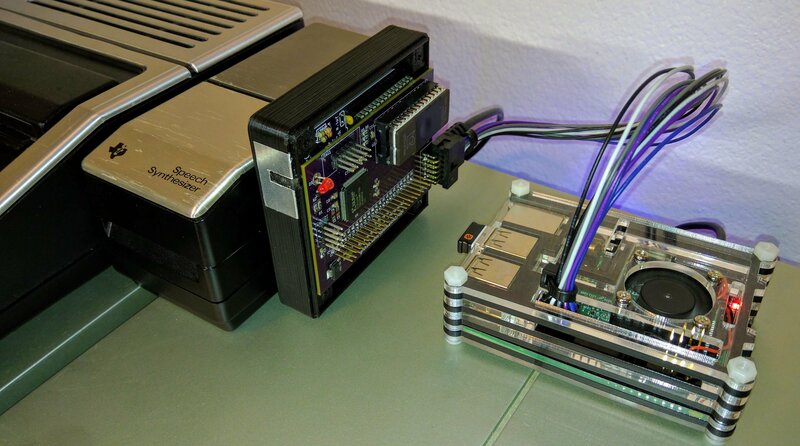 The Raspberry PI can be mounted on the PEB board or located externally. 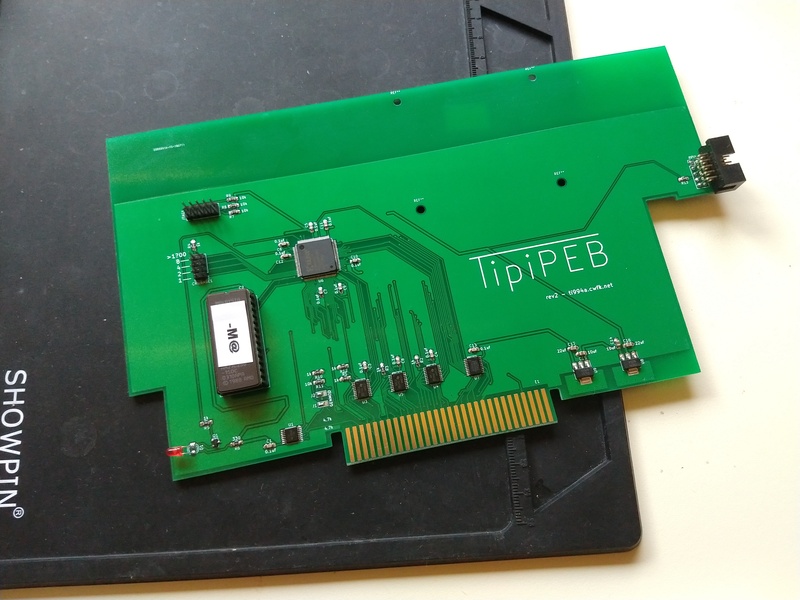 TIPI PEB card now available! Put up 4 this morning and they went QUICK! PEB card is exactly the same functionality as the sidecar but fits in your expansion box. We are building them and will place more online ASAP! Posted on August 6, 2018 August 8, 2018 Categories Ti-99/4a BlogLeave a comment on TIPI PEB card now available! 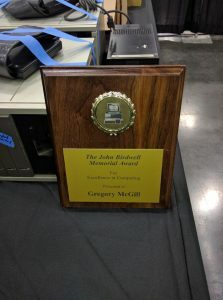 I was awarded the John Birdwell Memorial Award! I am honored to be in the company of the other recipients! Thank you to the committee for this! Posted on October 30, 2017 October 30, 2017 Categories Ti-99/4a BlogLeave a comment on I was awarded the John Birdwell Memorial Award! 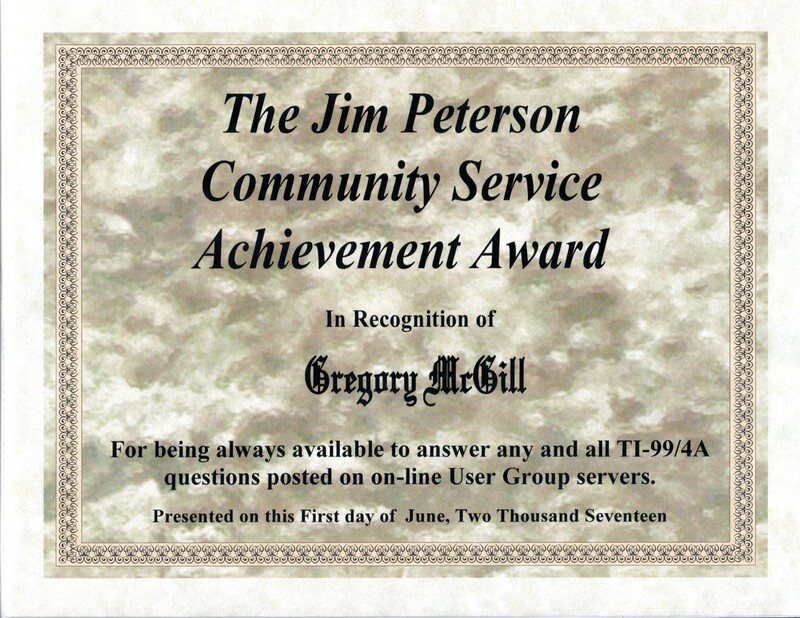 I was awarded the Jim Peterson Community Service Achievement Award! I am honored to be in the company of the other recipients! Thank you to everyone who voted for me! 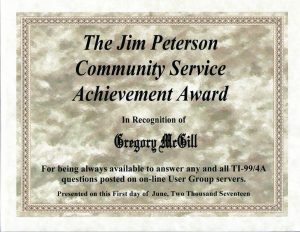 Posted on June 8, 2017 Categories Ti-99/4a BlogLeave a comment on I was awarded the Jim Peterson Community Service Achievement Award! http://floppydays.libsyn.com/ (also available on iTunes for you apple people) has been focusing on my favorite little computer: The Texas Instruments 99/4a home computer. Episodes 49, 50, 51 AND 52 are bits of history, available equipment and new technologies including the items sold here at arcadeshopper.com. Also lots of interesting information and links on other personal computers from the same era can be found on the site..